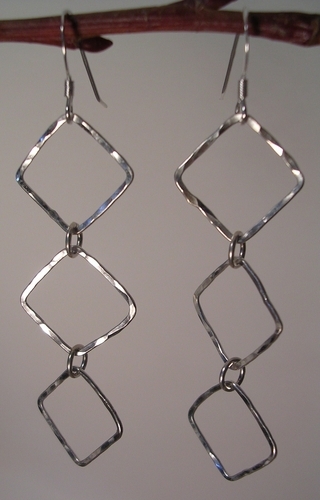 Sterling silver hammered links with crystal dangles. Can be ordered with your choice of crystal colours. 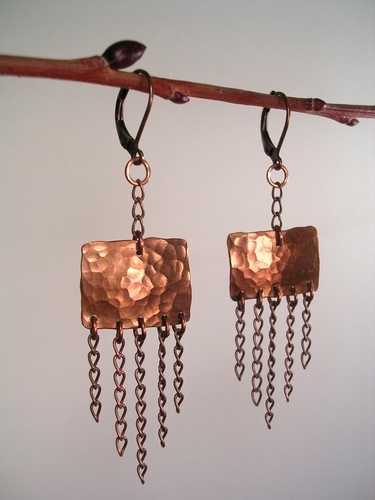 Hand cut, hammered and finished copper earrings with cut glass dangles on a copper chain. 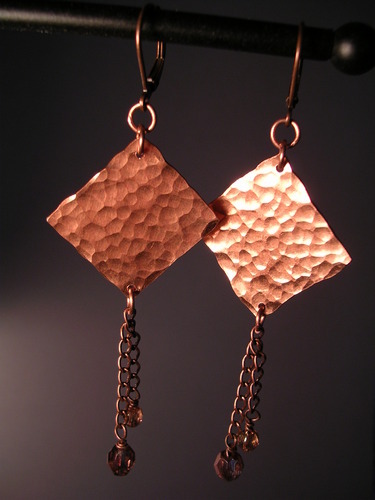 Hammered Copper and chain earrings. Nothing quite calms you like hammering Metal! 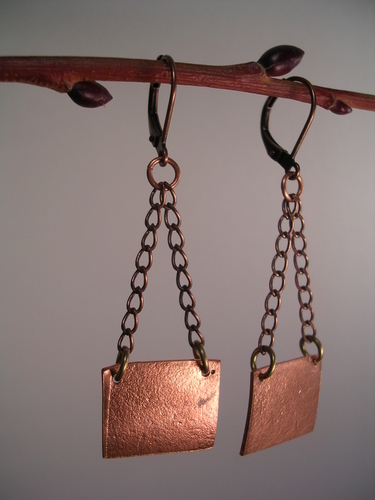 Shown on Copper Euro Back ear hooks, but also available with Sterling or Gold ear wires or posts. Contact me with your request! Little hammered Angles...no not angels that would just be wrong! Shown on Sterling Ear Wires, but you can get them on Gold or even Copper if you prefer, just let me know! Talk about Rigid! 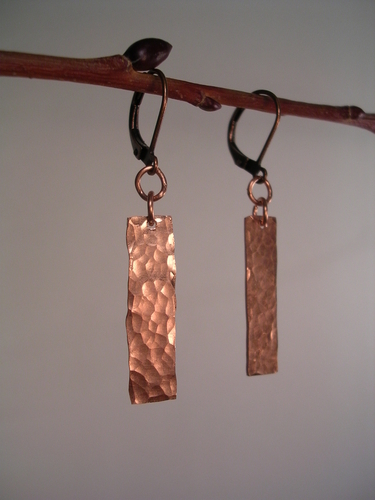 Hammered copper strips to dangle from your ears! Shown on Copper Eurobacks but can be hung from Sterling or Gold, just let me know what you need! 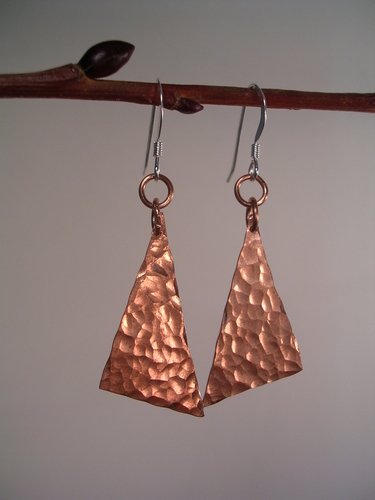 Made of sheet copper cut, hammered and finished. Shown here on Copper Euro Back closure, but can be put on Sterling hooks or posts. Just let me know how you like them. 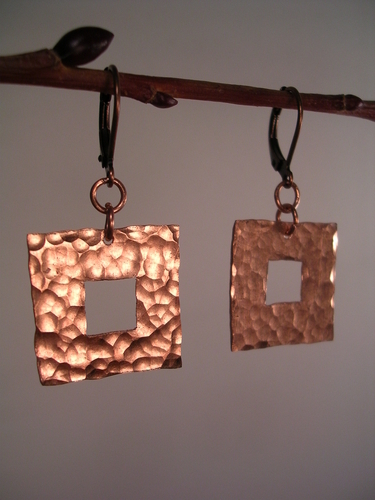 Made of sheet copper cut, embossed and suspended from a copper chain. Shown here on Copper Euro Back closure, but can be put on Sterling hooks or posts. Just let me know how you like them. 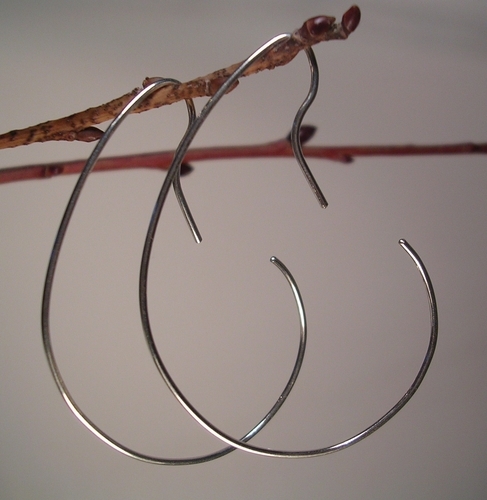 Made of sterling silver wire, gently hand curved to make a lovely hoop. Makes a bold and simple statement. I think you will love this one! 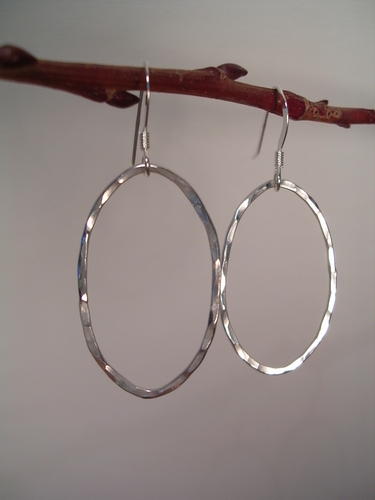 Made of a sterling silver hammered oval and decorated with a lovely simple clear glass bead. And it goes with anything. 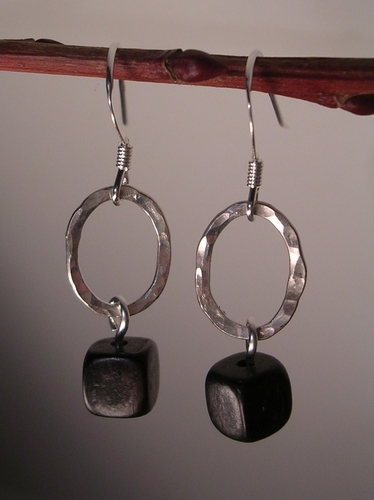 For these earrings, I used 3 sterling silver squares and hammered them silly. 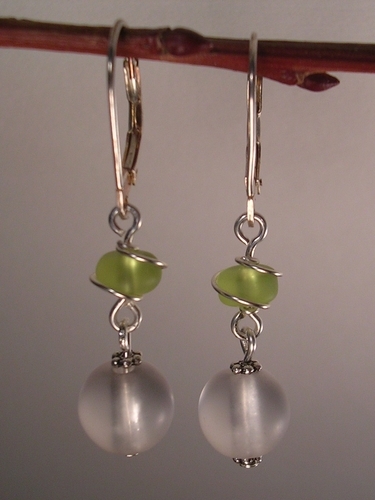 Then I linked them together for a pretty pair of earrings. Very versatile. 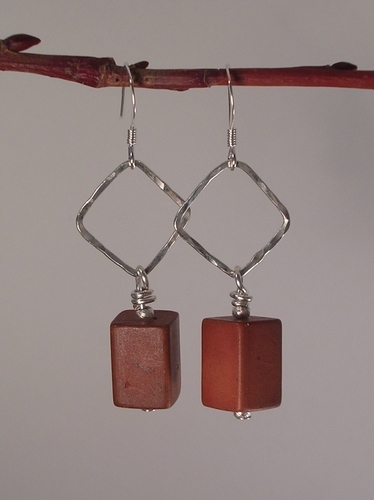 Take a square of sterling silver, hammer it like mad and then suspend a resin brown rectangular bead. Kind of a nice look! 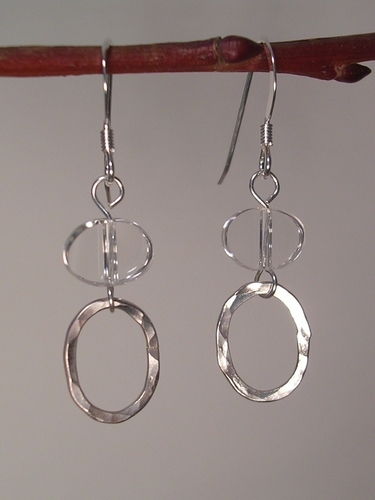 This is a pair of earrings created from 2 sterling silver ovals that have been hammer finished. Simple with a sparkle. Oh my heart! My heart! 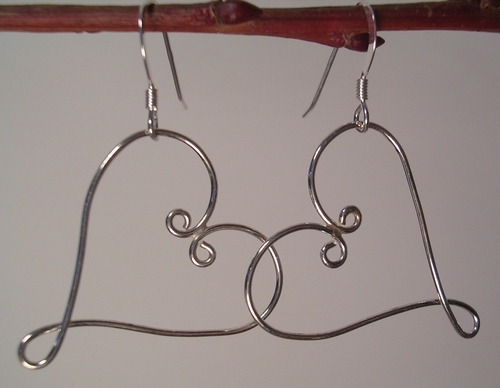 Here's a twist on the heart motif that dangles from some sterling hooks. Soldered to prevent heart break. 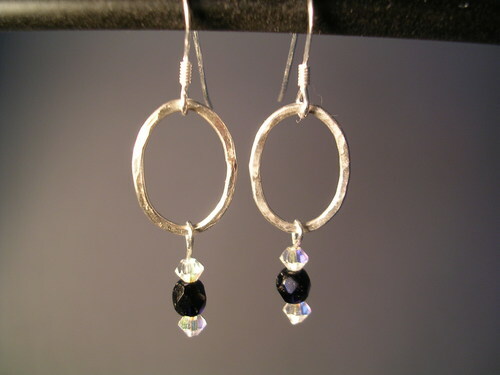 A cute hammered oval that clings to a squared ebony wood bead. What would it work with in your closet?